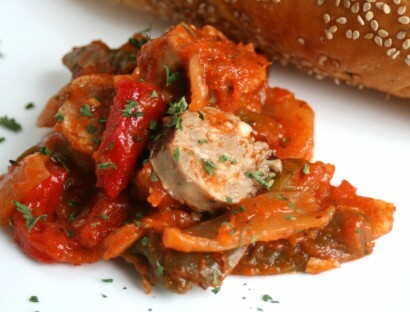 Who doesn't love sausage and peppers. I had so many different versions. I came up with this one after having a few blah boring ones. The secret in this dish is slow roasting the sausage until it is nice and soft, melt in your mouth. You can use sweet or hot sausage if you like it spicy or you can even mix the two. Sometimes I pile it up with bread, sometimes over pasta or sometimes just plain with the bread on the side. This is perfect for company, parties, or even game day. Heat a large oven proof skillet to medium high heat. Brown sausage links on each side. Once all of the sides are browned, place in an oven proof dish. Roast in oven for 30 minutes. While sausage is roasting; sauté bell pepper, onion and garlic, for about 10 minutes over medium heat. Once they start to soften, add the cup of sauce, roasted peppers, basil, garlic powder, pepper flakes, salt and pepper, and cheese, continue cooking for 5 more minutes stirring frequently. Remove sausage from oven, slice into pieces and addthe peppers and onions. Return skillet to oven for another 20 minutes until hot and bubbly and sauce is reduced. I wanted to let you know that I've chosen to pass along the Liebster award to you - if you've not seen it on other people's blogs recently, it's basically a little award for great blogs with under 200 followers. You can now choose up to 5 other blogs to pass the award on to. See my post here for details! That is gorgeous, wintery and just yummy. Congrats on the LB award too!! A.